Looking for Teachers jobs in Schools 2018 in Kerala? or Searching for Faculty Plus Teachers Kollam / Kerala November 2018? 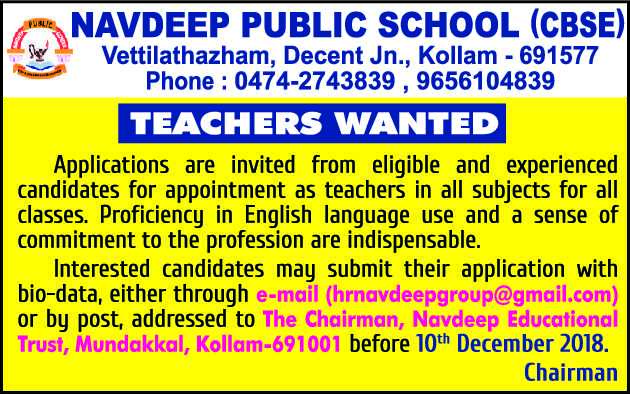 A School based in Kollam named Navdeep Public School, Kollam has advertised for recruitment of Teachers jobs vacancies. Interested and eligible job aspirants are requested to apply on or before 10th December 2018. Check out further more details below. About School: Stepping on the pedals of faith and hope we began with a host of golden expectations in 1991. Over two decades of tireless striving , with the unfailing grace of God, has facilitated the growth of this citadel of learning. Our history can be epitomised as the gradual but steady growth of excellence ensuing from correct vision and commitment. How to Apply: Interested and eligible candidates are requested to send application along with CV, all copies of certificates / testimonials and recent PP size photos at the email address or postal address mentioned below.